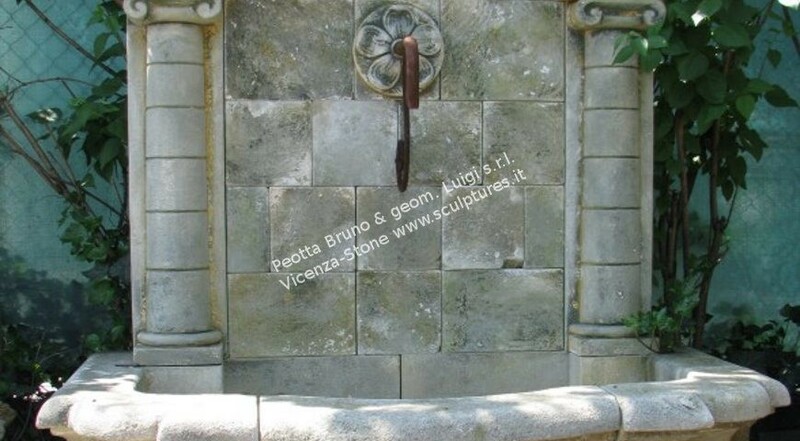 A typical carved stone wall fountain in French style used for garden and outdoor ornament. A round coping shape carved in different pieces for easy installation. The back bears a stone carved rosetta designed by our sculptors. On the rosetta an old iron spout in rust color. On the sides two semi-columns with Doric capitals, timpano on the top. Dimensions: Height 65" x Width 61" x Deep 37 1/2"